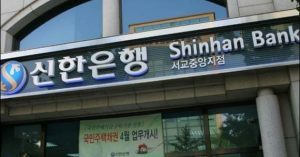 South Korea’s Shinhan Bank Will Support Cryptocurrency Exchanges | News by Wales Express News, People Before Profit! Bithumb and Korbit, two of the largest cryptocurrency exchanges in the South Korean market, have announced that Kookmin Bank deposits and withdrawals will be disabled by the end of January. Kookmin Bank, the biggest financial institution in South Korea, has decided not to support cryptocurrency exchanges and provide virtual bank accounts to cryptocurrency investors. On South Korean trading platforms, each investor is provided with a virtual bank account with which they can withdraw and deposit Korean won, without having to directly move funds from and to actual bank accounts. Over the past few weeks, local investors were concerned with the abrupt decision of Kookmin Bank to close down virtual bank accounts launched on South Korean cryptocurrency exchanges. Many traders feared that other banks would follow the decision of Kookmin Bank and simply cut financial links to cryptocurrency exchanges. With the recent announcement of Korbit, traders have become relieved and started not to fear about the possibility of a cryptocurrency trading ban. Previously, in an official document, the South Korean government stated that it had requested financial institutions and banks within the regulated finance industry to prevent providing banking services to cryptocurrency exchanges. What Will Happen to South Korean Cryptocurrency Market? This week, several local media outlets reported that a high ranking financial authority in South Korea claimed the government is planning to allow financial institutions to list bitcoin futures, as the US Commodities and Futures Trading Commission (CFTC) did in 2017. The government official explained that the listing of bitcoin futures would stabilize the market and enable the bitcoin exchange market to mature, reducing premiums and excessive speculation by local investors. In the upcoming months, the South Korean government will likely roll out practical regulations to protect both investors and businesses. In a statement released in December, a member of the cryptocurrency regulation task force noted that the government will follow the regulatory roadmap established by leading markets like Japan and the US. Given the current state of the market and the government’s decision to not impose a trading ban in the short-term, the South Korean cryptocurrency exchange market has been fairly optimistic over the past few days, as shown by the rising price and volumes of cryptocurrencies in both the South Korean and global market.